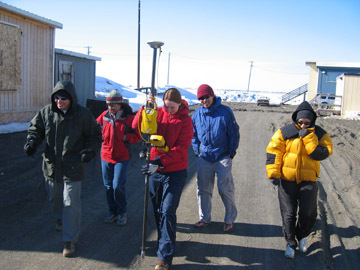 UNAVCO coordinated an annual site visit to the Barrow Arctic Science Consortium (BASC) facility with the arrival of the research team from University of Texas, El Paso, (UTEP) to both upgrade the DGPS base receiver and train the UTEP team on the system. The base was upgraded from a Trimble 5700 to a Trimble NetRS, which offers remote reprogramming and downloading of the base, and frees the previous 5700 base to be used as a second rover. Alternatively, this second roving 5700 can be set up as an RTK base away from the BASC facility. This will benefit groups wanting real-time results > 10 km from the BASC facility. Members of the UTEP group were trained on the system. The group manages the GPS equipment throughout the summer season.